Consumption of sugary drinks in Berkeley’s diverse and low-income neighborhoods dropped precipitously in 2015, just months after the city levied the nation’s first soda tax on sugar-sweetened beverages. Three years later, residents in these neighborhoods reported drinking 52 percent fewer servings of sugary drinks than they did before the tax was passed in November 2014, shows a new report from the University of California, Berkeley. This drop more than doubles the 21 percent decline found in 2015. Water consumption also saw a bump, going up 29 percent over the three-year period. The study, which is the first to document the long-term impacts of a soda tax on drinking habits in the United States, provides strong evidence that soda taxes are an effective tool for encouraging healthier drinking habits, with the potential to reduce sugar-linked diseases like diabetes, heart disease and tooth decay. The study, which appears Feb. 21 in the American Journal of Public Health, comes at a critical time for jurisdictions considering soda taxes. While a number of cities, including Philadelphia and Seattle, now have soda taxes on the books, both California and Washington state passed bills in 2018 that ban municipalities from putting future soda taxes in place. The bulk of Berkeley’s soda tax revenue is dedicated to supporting nutrition education and gardening programs in schools and to local organizations working to encourage healthier behaviors in the community. Madsen is leading a team that has been tracking the drinking habits of residents of low-income and diverse neighborhoods in Berkeley since 2014, when 76 percent of voters came out in favor of levying a penny-per-ounce tax on all sugar-sweetened beverages. While the excise tax is levied on distributors, rather than directly on consumers, subsequent studies have shown that retailers incorporated the higher costs into the shelf price of the drinks. To find out about residents’ drinking habits, the team polls around 2,500 people each year in high foot traffic intersections in racially and demographically diverse neighborhoods across Berkeley, Oakland and San Francisco. The so-called street intercept surveys revealed a steep drop in sugar-sweetened beverage consumption in Berkeley between 2014 and 2017. The decrease was seen overall for sugary drinks, and specifically for soft drinks like Coke and Pepsi, sports drinks like Gatorade and Powerade, and sweetened teas and coffees. 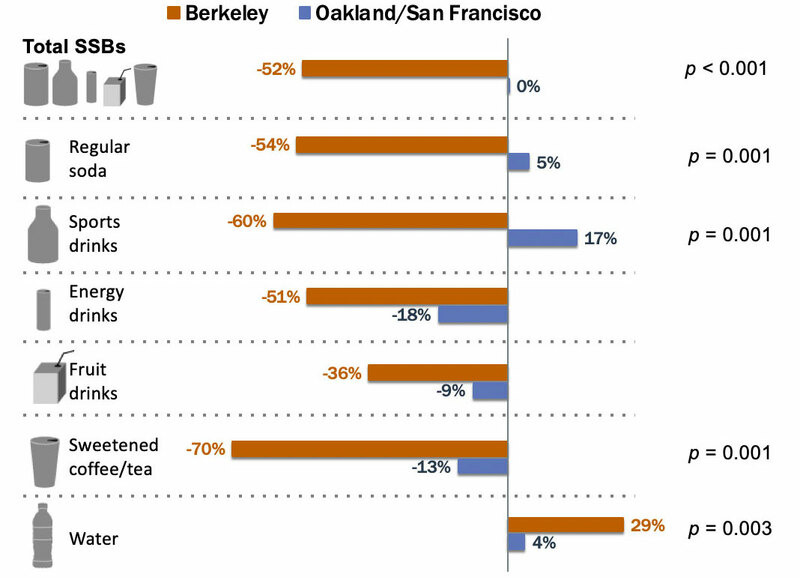 Residents of neighboring Oakland and San Francisco drank about the same number of sugary beverages in 2017 as they did in 2014, suggesting that these changes were unique to Berkeley and not signs of a regional trend in drinking habits unrelated to the tax. The study does have its limitations, Madsen cautions. Street intercept surveys do not provide a random sample of residents, and Berkeley is a relatively small and highly-educated city. And price hikes may not be the only driving factor behind the change, Madsen says. Taxes also send a message about societal values, which can have a big impact on consumer behavior. However, the similarity between these results and other long-term results in Mexico, which also saw increased effects of its soda tax over time, suggest that these measures can be a powerful tool in the fight against diabetes, cardiovascular disease and obesity. Co-authors include Matthew M. Lee of the UC Berkeley School of Public Health; Jennifer Falbe of UC Davis; Dean Schillinger of Zuckerberg San Francisco General Hospital; Sanjay Basu of Stanford University and Charles E. McCulloch of UC San Francisco. The research was supported by the National Institute of Diabetes and Digestive and Kidney Diseases of the National Institutes of Health under Award Numbers R01DK116852 and K01DK113068 and by the California Endowment under Award Number 000533.